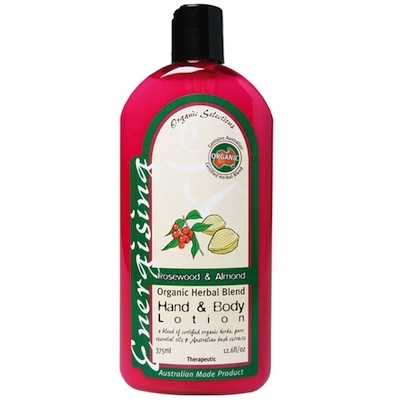 Hand and Body moisturising lotion offers powerful skin hydrators in an one all-purpose blend for all skin types. Designed to smooth and nourish the skin. A revitalising aroma for the soul. Purified Water, Certified Organic Botanical Blend of Lavender, Chamomile, Horsetail (herb), Marigold, Rosehip, Burdock; Organic Safflower Oil, Biodynamic Avocado Oil, Biodynamic Macadamia Oil, Grapefruit Seed Extract, Australian Bush Extract of Kakadu Plum Glycerol Monostearate, Wheatgerm Oil, Jojoba Oil, Soy Lecithin, Glycerin, Guar Gum, Citrus Seed Extract, Olive Leaf Extract, Potassium Sorbate, Organic Locust Bean Gum, Vitamin E, Cetyl Stearyl Alcohol, Rosewood Essential Oil, Sweet Almond Oil.